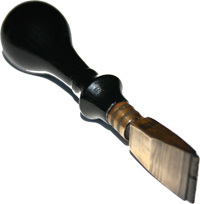 Graham Welsh - Violin making, restoration and repair. GRAHAM WELSH - MAKING, RESTORATION and REPAIR. I'm enjoying 'keeping my hand in' on my violin work, while I hold down my full time job. I hope to pick up here where I left off in 2009. Meantime I'll try and keep the website available as a means of communication with a view of regenerating it when the time is right. The online store was closed in 2009, I have a few items left for sale, check out via PayPal. Still here for advice and assistance. Established since 1997 in Ayr, so now in my 24th year. 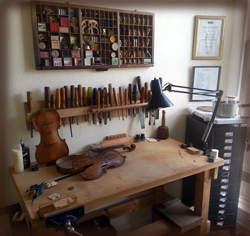 You'll still be made very welcome at my personal workshop for violin repairs, advice on set ups and insurance valuations. I have a few violins and bows for sale as well as a few specialist luthier tools. Please go to the contacts page for the full address details. Announcement...I'm currently looking for old violins to restore, so please keep me in mind, thanks. Feel free to bring along your instrument and have it checked out in the workshop. Repairs and all restorations come with a free estimate of work required for your instrument. Valuations can normally be done there and then. A short film by Chris Scott, starting to document the life of Dundee luthier Graham Welsh. Shot on location at Angus Violin Studio, it tells the story of how Graham got into the world of violin making and restoring. It is hoped that more can be added to this documentary in the near future. Also videos of some work that I do in the workshop from time to time. Design by Lance Taylor © 1999-2015 Graham Welsh. All rights reserved.